As shown, the idea is to locate your suspected fat person, and convince them to remain stationary (the ease or otherwise of this task provides an early indicator of fatness). Hold up your FATScan at arm’s length, and observe the subject through the hole. 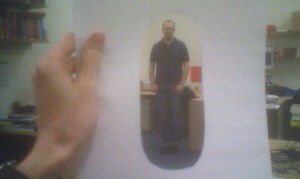 A normal person, viewed through a FATScan, will have a roughly even gap all around him, as shown. A fat person will come dangerously close to the latitudinal margins of the viewport, causing clipping. Secondary symptoms may also be apparent; the fat person may be clutching a chocolate eclair, being unwarrantedly jolly, or even visibly sweating. A word of warning: make sure your subject is fully upright. Early FATScan practitioners were forced to recall a number of patients after it was suggested that they were not in fact fat, but merely lying down. The glory of the FATScan is not only its affordability and portability, but its eminent adaptability. The accompanying prototypes, for example (shown left, right), are believed to reliably detect scientists and clowns respectively (the latter doubles as a handy screening device for genital deformity). The government is being petitioned to provide the scientist detector to all fat people, so that they can determine whether the person scanning them is in fact a scientist, or merely a nutter with some paper.